UPDATE II: Here’s the ESPN report. The souls of thousands of Auburn fans were poured into in Jordan-Hare Stadium last night. And also the ashes of at least one. At least we’re assuming / hoping it was Auburn fan. Maybe it was just one of those fans of the game who wanted to be laid to rest at the site of the greatest game ever. We may never know. 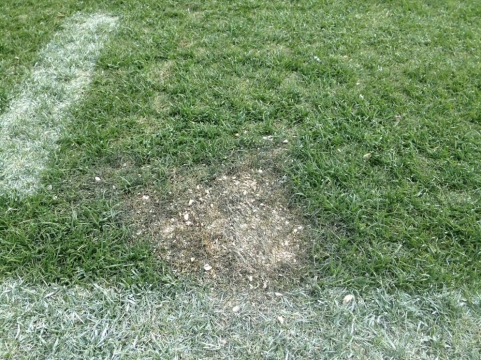 Yes, amid the cups and tears and shakers and Lord knows what else still “littering” the field after Auburn fans made it disappear Saturday night is a pile of what the Auburn Turfgrass Management team says is cremated human remains. We presume the deceased asked to be laid to rest at the site of the greatest football game ever. We’re told this isn’t the first time this has happened—the grounds crew has apparently become pretty adept at identifying crematory ashes (it’s the bone fragments). But surely it’s the most ______. Apparently it also kills the grass. UPDATE: We’re now told that sideline is the Auburn (duh) sideline at about the 40 yard line. In other words, right around where we all said OH MY GOD. It’s holy ground. Saban’s wrath claim another victim. Vaya con dios. GA coaches fall on their faces, ala coaches set themselves on fire! I love the end “right where we all said OH MY GOD. It’s holy ground.” Someone got their final wish–in a BIG way.